Ever since we stopped roaming and started farming, we've been looking for ways to improve our harvests. One old school approach is to grow plants close to one another, otherwise known as polyculture. Whether it's two crops, three crops, or a crop and a beneficial but not otherwise harvestable plant, farmers have long realized the botanical buddy system results in larger plants producing more seeds (read: more food). Compared to monoculture (growing a single crop over a large area, e.g. your typical North American field of corn or wheat), polyculture can reduce the harmful impacts of plant-eating insects, microbial diseases, or weedy competitors. More plant types means a reduced need for pesticides since (1) more habitats are available to foster predators who will happily feast upon plant pests and competing weeds, and (2) pests of a particular crop aren't able to spread between individual plants as easily. Polyculture can also help to ensure crops get the light, water, and nutrients they need to flourish, as different plants often complement each other with respect to access to these resources. Finally, having more than one crop around can facilitate pollination (and thus seed production) and maximize space use. In developing countries where crop production is otherwise constrained by a dependence on native soil fertility (vs. applying fancy fertilizers), farmers often use polyculture to improve yields. Even in poor soils, this cropping approach is often superior to monocultures. Let's look at a couple of examples of polyculture. Beans climb the cornstalks, while squash spread out via vines over the ground below. Bean leaves fit nicely in between the large long leaves of corn. Squash leaves shade the ground, blocking weed germination and helping to keep water in the soil. All three plants differ in how their roots are structured, so there aren't many toes being stepped on, so to speak, as their roots grow together in the same bit of soil. Beans acquire a bunch of nitrogen from the atmosphere via Rhizobium bacteria residing within their root nodules, reducing competition for this soil nutrient. Beans and squash can use forms of phosphorus found in soil unavailable to corn, again reducing nutrient competition. In China, numerous crop combinations have been investigated as a means of improving yields. Impressively, half of the total grain yield in China is produced with polyculture. One approach, dating back at least a thousand years, is found in rice paddies. These are inoculated with aquatic ferns (they look more like duckweed than your typical forest fern) of the genus Azolla just after rice is transplanted. The ferns grow rapidly, covering the water surface and edging out weeds (rice grows up out of the water). Rice plants are also helped by the leaves of Azolla species being inhabited by the cyanobacterium Anabaena azollae, which provides the ferns with nitrogen captured from the atmosphere. This nutrient is then transferred to rice plants as the ferns die and undergo decomposition. 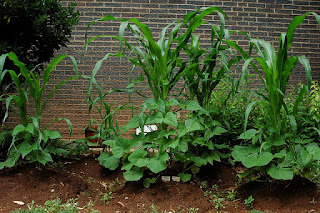 Another polyculture found in China is corn being grown alongside peanuts. In calcareous soils, peanut monocultures often develop chlorosis due to a lack of iron (it's kinda like anemia for plants). However, this deficiency is less severe when the peanuts are grown with corn. Somehow the roots of each plant are able to interact in such a way to get iron into the peanut plants. One possibility is that corn roots release iron-binding molecules capable of facilitating the movement of this metal within the soils. Polycultures based around coconut trees have seen use throughout the tropics. Trees grow up to 30 m in height, with leaves remaining only at the very top. They also are productive for decades, so land set aside for coconut stands remains in use for a long time. Given the height of coconut trees, it's possible to plant a wide range of food crops and spices beneath them (e.g. bananas, pineapples, coffee, ginger, turmeric, and black pepper) to increase the productivity of the land. Polycultures also increase coconut nut yields, this being attributed at least in part to the fertilization of the associated crops and a reduction in weed growth. Zhang C, Postma JA, York LM, Lynch JP. 2014. Root foraging elicits niche complementarity-dependent yield advantage in the ancient 'three sisters' (maize/bean/squash) polyculture. Annals of Botany 114(8):1719-1733.